Our software user workshops enable you to unleash the maximum performance of your CAQ-system. The user workshops strengthen your command of the modules and tailor-made training exercises improve your mastery of your CAQ-system by simulating day to day work situations. Innovations and improvements to the software are introduced and conveyed by means of practical examples. Working together with software users from other companies allows you to address individual questions and solutions from the shop-floor and exchange practical knowledge – thus providing invaluable synergy effects. Standard Preis: 780,00 € + USt. GCC Preis *: 702,00 € + USt. Dieser Workshop wird durch unser Partnerunternehmen GFQ Akademie GmbH organisiert und durchgeführt. Um sich an dieser Veranstaltung anzumelden, müssen Sie sich einloggen. Learn how our Compact.Net module supports you with tools for inspection planning, inspection data gathering, and evaluation/analysis, as well as how to perform process-accompanying inspections, incoming or outgoing goods inspections, and sophisticated process control. Learn how to fully utilize our EMP.Net module in order to create and process initial samples in accordance with ISO 9001, QS 9000 / IATF 16949 (PPAP), or VDA (PPF). Learn how our PMM.Net module supports you throughout the planning, administration, control, calibration, and capability analysis of all your gauges. Learn how PMS.Net facilitates the intelligent servicing, maintenance, and inspection of all equipment, manufacturing systems, or tools in your company. Learn how to use the clearly defined RPNs, Ishikawa diagrams, and expressive risk matrices of Risk.Net in order to easily fulfil key requirements of customers and regulating authorities. Learn how to use 8D reports, Ishikawa diagrams, the 5-Why method, and many other functions of REM.Net during and after the processing of complaints in your company. This course aims to increase the participant’s overall proficiency in working with the CAQ.Net® quality assurance modules on a day to day basis. Only for CAQ AG Factory Systems software customers/users. 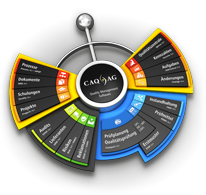 All users of the respective CAQ.Net® quality assurance modules. Ermäßigte Teilnahmegebühr für Inhaber der GFQ Corporate Card (GCC). Gilt nur, wenn die GCC-ID der zum Zeitpunkt der Veranstaltung gültigen GFQ Corporate Card direkt bei Bestellung via Internet www.GFQ.de mit angegeben wird. Für Kunden der CAQ AG Factory Systems mit bestehendem TSP (Top-Service-Paket) werden bei Online-Buchungen 25 % der jeweiligen TSP-Jahresgebühr auf Teilnahmegebühren von Software-Anwender-Workshops angerechnet.